(Video link here.) We’ve long been a fan of Elizabeth Streb, an “action architect” whose wondrous choreography interweaves risk, action, danger, and flow into a thrilling experience; her dancers interact with swinging concrete blocks and giant wheels where the potential is full-on hurt if they make a mistep; they often run into walls and fall flat on their faces, artfully, an amazing thing to see. We were knocked out by Streb’s answer, in a recent 99% interview to the question: Why is risk necessary in art? “When you are attempting to create new languages, the investigations can get stuck in the brain and often find no escape there, especially when the idea is invisible as it is while contending with extreme actions, forces, and time. I have found it to be a fruitful idea to agree to get hurt a bit or more than a bit, in the search for a real move. This “real move” is the holy grail of the act, the heart of the machine, the virus in the Petri dish. This alone tells the truth of where, when, what, and how. Two of them involve having “very little money” something that many people perceive as risky. Streb’s risks appear to have paid off. The 99% interview is full of other Streb gems, like “limitations are the holy elixir for performance” and “I’m not a very organized artist”. 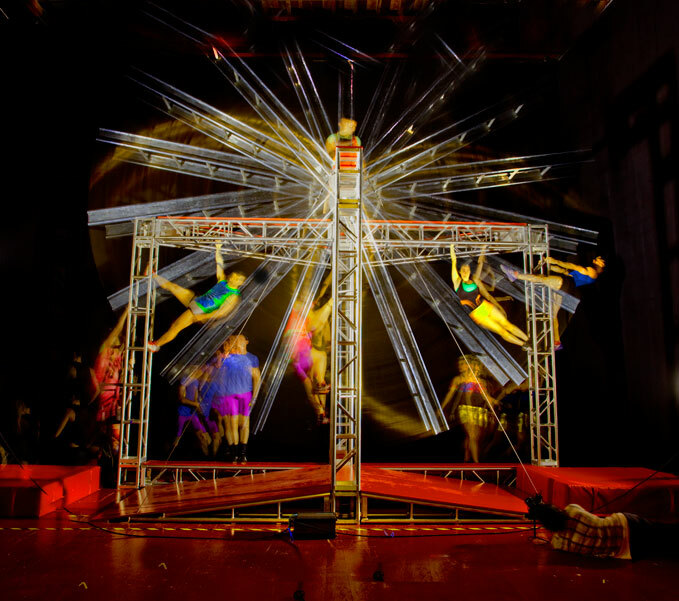 At Streb Lab for Action Mechanics (SLAM)in Brooklyn, you’ll find classes in various forms of “PopAction” for kids and adults; you can also watch her dancers rehearse. Her new work, Kiss the Air!, will be performed in December at the Park Avenue Armory in New York City. I know some of Streb’s dancers (now ex-Streb dancers) who have suffered a wide variety of serious injuries (broken back, ruptured spleen) as a result of their performances in Streb’s company. What exactly do you find inspiring about her statements on risk-taking? The dancers I know have been young people, just out of school, who were thrilled to find work with a renowned company, only to have their careers end in the tragedy of great physical pain and monumental medical bills. Elizabeth Streb aside, I am a big fan of your blog! Helen, Thank you for your Comment and the link to Brian Calavan’s Letter on McSweeneys, and for their views of a whole other side. Point taken; I had not heard of her dancer’s injuries and the tragedy you describe. But I look back now at the risks I took when in my teens and twenties and wonder that I am alive, wonder how, given the nature of youth, any of us live to age. As you probably have gleaned from the blog, I am deeply interested in risk, and how we can use it to break through fear to expression, experience, invention, whatever it is that seems personally authentic and meaningful. To me, Streb’s statements and work shines a compelling light the questions of risk…her extremism helps to illuminate the notion, unique to each of us, though I am sorry to hear, at the personal cost to some of her dancers. Clearly, there are many more questions to explore here. Because of my own injuries and unsought for experience with impact, I can hardly look at Kreb’s intriguing work, and certainly can’t do it without wincing. However, I, too, am very interested in risk as a general principal, though more from a psychological perspective. NOT WILLING to get so hurt that you can’t come back again??? How do you measure such a thing? Sally, this is the New York Times article about Streb and injuries, plus. http://www.nytimes.com/2007/06/02/arts/dance/02stre.html?pagewanted=all, It makes interesting reading. For sure Streb’s work brings up many reactions and questions…which I think is why her work is powerful. We’ll continue to explore the question of risk on ‘the improvised life’; it is the question that just about everyone we know is grappling with, as the look for what is meaningful and authentic. I agree with Helen. Risk doesn’t have to be foolish. Defying gravity is foolish not inventive or freeing. Knowing our own traditional limits and pushing past those is risk. Certainly risking other’s safety which would impact their ability to function is wrong and unfair. Blaming those who are injured in the ways described is just plain unfair.